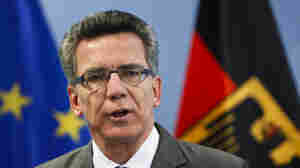 October 6, 2010  German Interior Minister Thomas de Maiziere is calling recent warnings of terror attacks in Europe "hypothetical." He says there are no signs of any imminent attack. August 25, 2010  German officials are considering a ban on employers' use of Facebook before hiring. March 5, 2010  "I don't see how it's feasible to wriggle out," says Berkely economist Barry Eichengreen. July 24, 2008  Presidential hopeful Barack Obama speaks to a sea of tens of thousands in Berlin today. June 17, 2008  When football and girl power meet in Tehran -- even under the vigilance of Iran's Moral Guards -- women soccer players whizz across the field, and legions of female fans speak about their rights to attend a game. April 9, 2008  Murat Kurnaz's journey from Germany to Guantanamo Bay.